Thank you for joining Making Strides Against Breast Cancer. Welcome to your fundraising dashboard. Answer a few questions so we can get to know you better. Add photos and/or videos and update the 'Why I Walk' section. You indicated that you are a breast cancer survivor or caregiver. Would you like to display the survivor or caregiver badge(s) on your personal page? We've provided a starter goal for you. Update your goal to best suit your needs. Please answer a few questions so we can get to know you better. Are you an Avon Representative? Please enter your 8-digit Account Number. Diagnosis date cannot be a future date. Birth date cannot be a future date. Would you like to learn about providing a gift to the American Cancer Society in your will, trust, or financial plan? How would you like to ask for donations? How would you like to share your page? How would you like to invite friends to join you? 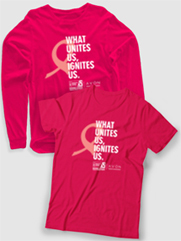 Connect your Making Strides Against Breast Cancer fundraiser to Facebook. Invite friends, share updates and collect donations on Facebook. Keep track of your progress. The money you raise on Facebook will count toward your goal. Log in to use Facebook's fundraising tools to invite friends, share updates and collect donations. We'll keep track of your progress on Facebook and on your Making Strides personal page, so you'll always know how close you are to reaching your goals. An invalid URL was entered, please try again. There are no contacts in this group. You can personalize your fundraising page with up to two photos and a video. Photos must be .jpeg or .gif files smaller than 4MB. Photos will be resized. Send emails to previous team members inviting them to join you. An error occurred while saving team leaders. You may only select three total team captains. That Personal Page URL is already taken. An error occurred saving your personal page URL. Please make sure to use only numbers, letters, - (dash), _ (underscore) and . (dot). That Team Page URL is already taken. Invalid file type. Please upload a .jpg or .gif file type only. Oops! Something went wrong. Please try again or contact 1-800-227-2345 for assistance. The minimum donation is $5 for cash or check. There was a problem adding your gift. Please try again later. Your story has been saved. Are you sure you want to replace the content of the email with the contents of this template? You have reached the limit of fundraisers for this Facebook account. You must log in to Facebook to connect this fundraiser to Facebook. There was a problem importing contacts. Invalid file type. Please upload a .csv file type only. Please select one or more contacts. No contacts were found in that file. No contacts were found in that file or that was not a valid contacts file. There was a problem creating your contact. Please make sure all required fields are completed and try again. An error occurred saving your Team Page URL. Please make sure to use only numbers, letters, - (dash), and _ (underscore). Like so many others, breast cancer is a very personal cause for me. Together with my community, I'm working toward that day. It gives me the chance to make a difference and to honor those touched by breast cancer by raising funds for groundbreaking research, and services for people dealing with breast cancer. I believe that there will come a day where the pain caused by breast cancer is a thing of the past. And until it arrives, Iâ€™m walking to inspire hope to those facing the disease and raising money for the American Cancer Society's Making Strides Against Breast Cancer event to help save lives from breast cancer. I hope you'll consider signing up too. Click okay to delete this offline gift. You cannot remove yourself as Team Leader. Please contact your event manager to make this change. The team must have a Leader. Please select someone from the list. selected. Please lower your selection count.